As of early September 2015, businessman Donald Trump continues to lead early polling among the 17 (or whatever the latest number du jour is) Republican candidates for President of the United States. Republican party establishment candidates who were expected to be at the front of the pack, such as Jeb Bush with his much-heralded endorsements and large donor base are lagging far behind. There is no doubt that Donald Trump has struck a nerve with a large number of citizens across the nation at just the right time. Americans are increasingly fed up with gridlock in Washington, the constipated effects of money and special interest groups on the political process, their weakening purchasing power, and the perception that China, India, or Mexico are defeating America in the game of life, or at some game or the other. In comes Trump, promising to make America “great again” with his bad hair, unrestrained ego, and fearless abuse of immigrants, journalists, other candidates, President Obama, or anyone else who crosses him, or crosses his mind. With the limelight focused squarely upon him, Trump is making his brand more and more well-known to America and the rest of the world, one insult at a time. Much lesser known are Donald Trump’s connections to India and Indian-Americans. His real estate empire in particular extends into many countries, and that includes India as well. Perhaps this shouldn’t be a surprise, considering the man named his signature Atlantic City casino after the one and only Taj Mahal of India and imported elements of its gaudy design all the way to the Jersey Shore. Meanwhile, wealthy Indians are enamored by American brands such as McDonald’s, Marlboro, Harley-Davidson, and Facebook. The Trump brand certainly has a potential niche among India’s many millionaires. It was only a matter of time before Trump landed one of his private jets onto Indian terrain with a head full of plans. But it hasn’t been easy- as many of us know, India can be a very difficult place to do business and the country offers a number of difficult roadblocks even for an American billionaire such as Donald Trump trying to enter an undeniably hot real estate market. 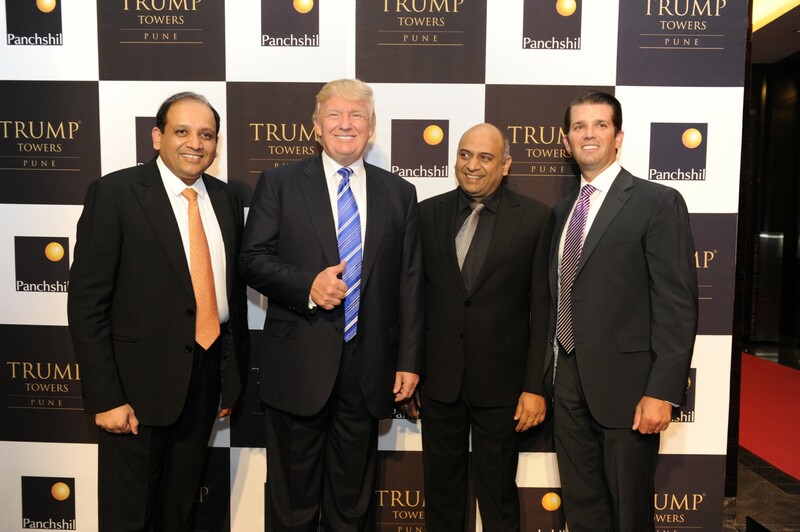 From what we are able to gather, Trump and his son, Donald Trump, Jr. have had designs on Indian real estate development, specifically starting with Mumbai since 2008. “Our entry has to be in Mumbai and that’s where everything is going on right now in terms of the high-end real estate,” said Jr. in 2008. In 2010 and 2011, Trump and Co. entered into an agreement with Indian company Rohan Lifescapes to erect a super luxury residential tower in Girgaum, a beachside Mumbai neighborhood. That joint venture seems to have fallen apart by 2013, when the Trump people walked out on the project. Reasons seem to include the Urban Development Department (UD) of Mumbai’s local government retroactively reporting that there were “irregularities” in the approval granting process, causing troublesome legal red tape. Disagreements over design aspects of the tower project stemming from the red tape and affecting the Trump luxury branding were also in play. Apparently neither side would bad-mouth the other to the press. Despite that setback, another Trump real estate project of twin residential towers was already underway in the nearby city of Pune through a partnership with the billionaire Chordia brothers after the Girgaum project fizzled out. The Panchshil Group are specialists in commercial real estate development, more so than residential, which is why the Trump stamp made a great deal of sense for them. 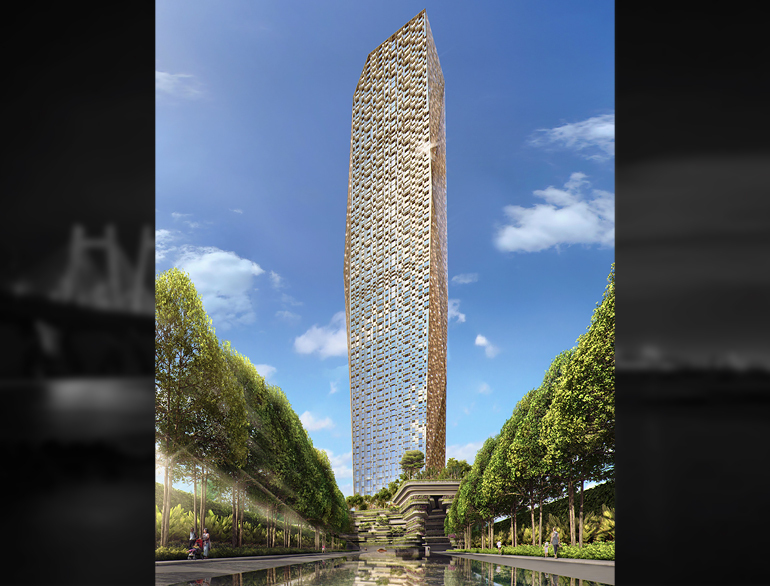 Soon after that, yet another agreement was signed with the Indian Lodha Group to construct a globally ambitious 77-floor golden-hued building in South Mumbai. The Donald himself seems to acknowledge its prominence even by the standards of his well established and far-reaching portfolio. “Trump Tower Mumbai will be unlike anything you have ever seen,” says Trump on the project website. “A jewel not just in the city skyline, but in the Trump crown.” An appropriate quote for India, which was once upon a time a jewel in someone else’s crown. Both projects are expected to be completed in the near future. Indian rich people, including several Bollywood stars have begun falling over one another to reserve their spots for a highly expensive and luxurious residential unit with that Trump branding. 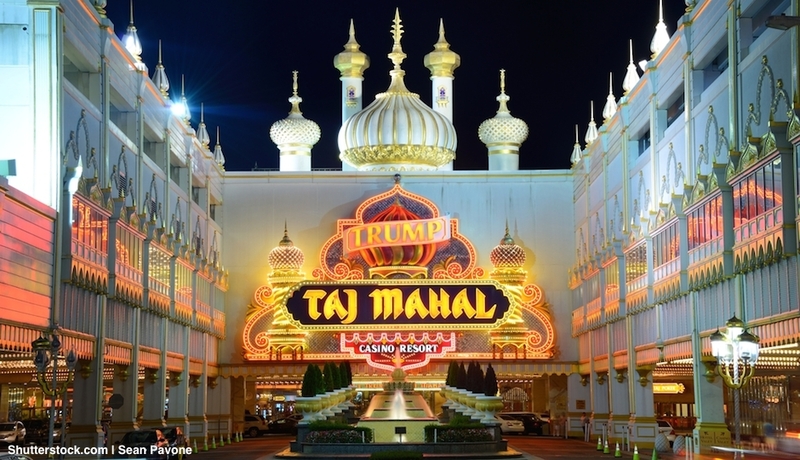 Meanwhile, one of Trump’s many business controversies involves the Trump Taj Mahal, the namesake of Shah Jahan’s monumental tomb in Agra, India and one of the seven wonders of the world. The resort/casino/hotel nearly shut down in 2014 due to struggling finances and union issues, but as of now it survives. The casino filed for bankruptcy in the same year, the Trump Resort group’s fourth such filing. Adding to the ignominy of the casino’s past was an unfortunate carjacking incident in the casino parking garage where two Indian-Americans were shot, one of them fatally, in 2011. Donald Trump has taken a strong stand on an issue of high importance to India and the Indian diaspora. The question of how many work (H1-B) visas for the United States to issue is a perennial political football in US-India relations. Trump has come out strongly against increasing the number of these, many of which are given to Indian citizens working in technology jobs in the United States. He is of the belief that these jobs should be given to Americans instead. This position brings up several additional questions. Firstly, are Americans qualified to take these jobs? Secondly, would they accept these jobs at the significantly lower pay that foreigners are willing to accept because they are handcuffed to the visa and green card sponsorship issues? Finally, could Trump’s stance be unexpectedly good for India because it might help stanch the highly damaging “brain drain” of some of India’s best and brightest to the United States? I believe the answers are no, no, and no in roughly that order. Yet another controversy Trump has embroiled himself in just this last week involves a South Asian American, Huma Abedin. Born of an Indian father and Pakistani mother, Abedin was a leading aide to Hillary Clinton at the State Department and is the wife of the sexually troubled politician Anthony Weiner. Trump made an unsubstantiated allegation that she was a “major security risk as a collector of info,” which is nothing more than meaningless and mean-spirited babble, very clearly based on her race and religion. None of these strange positions on H1-B visas or Huma Abedin will matter, however. Trump is a typical and predictable flavor of the month in American politics, where election cycles are nearly three years long and the media covering the 2016 election are only too happy to give air time to candidates who are entertaining. He may be leading in the polls in September 2015, but he has very little chance of getting into office. Mahanth S. Joishy is Editor of usindiamonitor.com. Posted on September 3, 2015, in Politics/Diplomacy. Bookmark the permalink. 1 Comment.